Lot Detail - Wayne Gretzky's 1979-80 Edmonton Oilers Game-Worn Rookie Season Jersey - Photo-Matched to His First NHL Regular Season Home Game and Numerous Others! Wayne Gretzky's 1979-80 Edmonton Oilers Game-Worn Rookie Season Jersey - Photo-Matched to His First NHL Regular Season Home Game and Numerous Others! Please take note that we will be screening the bidders on this particular lot due to the potential value. The bidders will eventually need to be pre-approved in order to be able to bid on this lot. Asking the intriguing question of whether or not “the kid” can excel in the NHL, one noted hockey publication pondered exactly that about a youthful Wayne Gretzky in the fall of 1979, when the 18-year-old prodigy from Brantford was embarking on his soon-to-be iconic Hall of Fame career. In true "Great Gretzky" fashion, young number ninety-nine shattered all doubts his rookie campaign, picking up 51 goals and 86 assists for 137 points, finishing the 1979-80 season tied with Marcel Dionne for the NHL scoring lead. In doing so, Gretzky became the youngest player in history to score 50 goals in a single season and was rewarded with his first of nine Hart trophies as the league MVP. 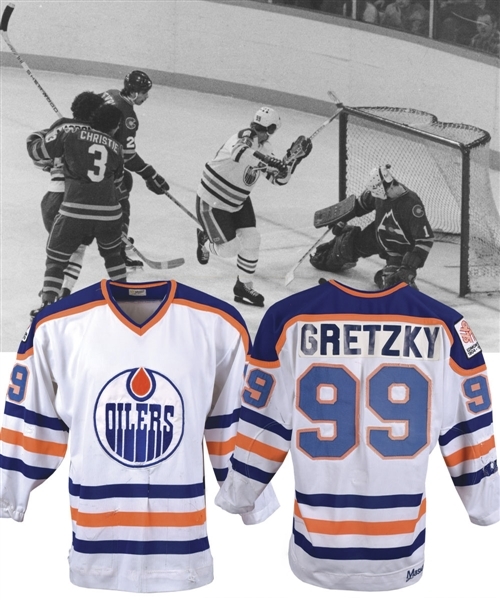 We are extremely proud to offer one of, if not arguably THE most important hockey jersey in the history of the game, with an Edmonton Oilers white home jersey worn by the incomparable Wayne Gretzky during his historic rookie season of 1979-80. Photo-matched to numerous contests including his very first NHL home game where he netted an assist, on Oct 13th 1979, photo-matches are present for four additional games early in the season (all thoroughly detailed on the web portion of this description), between Oct 13th and Dec 26th, with the probability extremely high that Wayne wore this very sweater while scoring his first NHL goal, on Oct 14th, the following night after his photo-matched Oct 13th game. This battered specimen is one of only two white uniforms that we believe were worn by the superstar that season, with this backed-up by photographic evidence. A Maska Superfil label remains affixed at each end over the inner collar, with the historic garment measuring-out to roughly a size 46. The familiar oil drop team crest with embroidered detailing graces the chest, with “99” over the sleeves and verso in blue-over-orange layered twill. Utilizing a loop-style fight strap, an embroidered Maska label is situated over the reverse hem, with the Edmonton 75th anniversary crest placed over the right shoulder. Featuring considerable game wear, seven stitched team repairs are visible over the left arm, with dozens of stick marks, slashes and a few unrepaired holes. The opposite sleeve exhibits additional burns and cuts along with thirteen repairs, with a number of material runs, stick marks, scuffs and holes over the lower front and marks and slashes over the lower reverse. The original two-tone numbers have been removed and re-stitched to the jersey, with this done to rectify a common problem with these first-year Maska uniforms as the material shrinked at a different rate compared to the numbers, causing unattractive puckering. We have examined a number of shirts from this set and a few have shown extensive puckering at the numbers with obvious material "waves" showing on the inside behind the numbers. To relieve this, the team removed the crinkled, shrunken numbers, laid them flat against the jersey and re-attached them (a practice common, seen often on Bruins uniforms from the Seventies). Each number “9” display’s an extra row of stitch marks from where they had been removed, with evidence visible of the placement of the numbers before shrinking, with the ghostly outlines of the identically-shaped numbers remaining. At no point did this jersey have numbers other than the original examples currently on the garment. The nameplate is not original to the jersey. The jersey was obtained back in 1980 by long-time Oilers employee, visiting team stick-man and noted collector Rick "The Stick" Elaschuk, and it was given to him at that time in its current condition, with Rick relaying that he remembers the jersey had no nameplate (it would have been recently removed by the Oilers to affix to the second white home jersey Gretzky begun wearing later in the season, in early-1980), and that he approached the Oilers seamstress (Alberta Crest Art) to re-apply a Gretzky nameplate. Although from the period and very similar to the nameplates the Oilers wore in 1979-80, it is not identical. Originally sold as part of the Edmonton Oilers Auction in 2005, the important jersey has proudly resided in a private collection ever since. A Canadian cultural relic who's all encompassing importance is hard to fully contemplate but wonderful to ponder, a Classic Auctions LOA will accompany this priceless treasure, along with numeric images for each photo-match. As mentioned, numerical images will accompany for the photo-matches. The first numerical image (Oct 13th 1979 – Wayne’s first NHL home game) has been matched to the little black mark visible between the bottom of the team crest and the top of the blue striping band. The second image (Nov 2nd vs the New York Islanders) has been matched to black mark to the right of the reverse numbers, while the third image (Dec 9th vs the Hartford Whalers) has been matched to the marks over the left side of the waist, with these fading somewhat but clearly visible, with the image also showing the heavily worn elbows and repairs, with the split beneath the team crest also appearing to show. The next image (Dec 16th vs the Winnipeg Jets) has been matched to the fraying on the front of the jersey, proving to a certain degree that the fraying was done naturally, with a mark under the team crest also matching. The Winnipeg Jets program cover (included with the numeric images) shows what’s believed to be an image from this contest, with the repair over the right sleeve visible. Lastly, the final image (Dec 26th vs the Colorado Rockies) has been matched to the circular repair on the right sleeve, with this particularly-shaped repair matching the placement within the sleeve’s striping perfectly.